Have you got a question which you would like to put to 3 former members of the House of Lords? 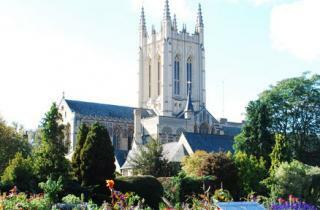 At 7.45 pm on Friday 12 February, the Dean of St Edmundsbury will chair ‘Any Questions?’ at St Edmundsbury Cathedral, Bury St Edmunds. She will put submitted questions to a panel of distinguished guests: Lord Tebbit, Lord Jenkin and former Lord Bishop Tim Stevens. Questions should be submitted to anyquestions@stedscathedral.org. Tickets for the event are available from the Cathedral Office priced £10 per person (includes glass of wine) or call 01284 748720. Student tickets are available at £5. A pre-event two course supper is being offered at Pilgrims’ Kitchen, the Cathedral’s restaurant. Price £15 per person bookable at the Cathedral Office. The panel consists of:- Norman Tebbit, member of the Conservative Party, serving in the Cabinet from 1981 to 1987 as Secretary of State for Employment, Secretary of State for Trade and Industry, Chancellor of the Duchy of Lancaster (1985–87) and Chairman of the Conservative Party (1985–87). He entered the House of Lords in 1992. Patrick Jenkin, member of the Conservative Party, became Minister for Energy in 1974 just weeks before the Conservatives fell from office. He served as Secretary of State for Social Services, Secretary of State for Industry, and finally as Secretary of State for the Environment. He entered the House of Lords in 1987. Tim Stevens was Bishop of Dunwich from 1995 to 1999 and then Bishop of Leicester from 1999 to 2015. From 2003 to 2015, he was a member of the House of Lords as a Lord Spiritual and served as Convenor of the Lords Spiritual from 2009 to 2015.